2017 World Brain Bee – Deutsche Neurowissenschaften-Olympiade e.V. 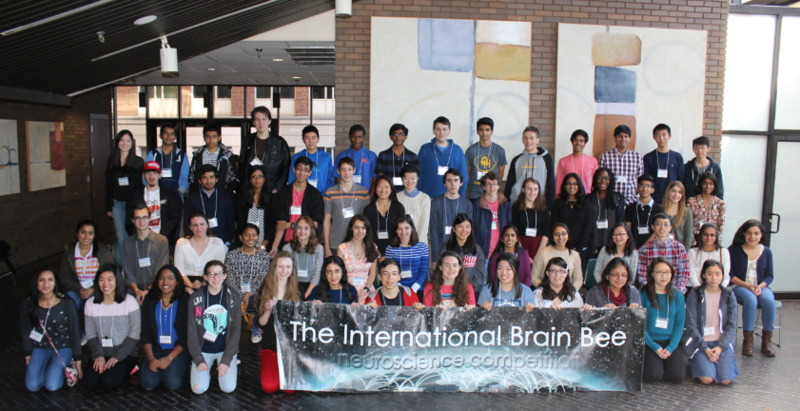 Future neuroscientists from around the world met in Washington, DC this week to compete in the nineteenth World Brain Bee Championship. The Brain Bee is a neuroscience competition for young students, 13 to 19 years of age. It was hosted by the American Psychological Association. The 2017 World Brain Bee Champion is Sojas Wagle (pictured), a sophomore from Har-Ber High School in Arkansas, USA. Sojas has a breath taking history of accomplishments. He is the captain of his school’s Quiz Bowl Team, and was state MVP for the last two years. He placed third in the National Geographic Bee in 2015. Last year, he was chosen for “Who Wants to be a Millionaire” Whiz Kids Edition. By the end of the game show, he had won $250,000, and later donated some of his winnings to his school district and a children’s hospital. He is also a member of the Arkansas Philharmonic Youth Orchestra where he plays violin as first chair. Second Place went to Milena Malcharek of August Witkowski High School in Cracow, Poland. Third Place went to Elwin Raj A/L P. Raj Vethamuthu from Sbpi Gopeng High School in Malaysia. Germany (Julius B.) and Israel tied for fourth place, and Iran came in fifth. Sixth thru tenth places went to Grenada, Canada, New Zealand, Australia and Korea.